In last week’s blog, Father Jonathan wrote about the Feast of the Birthday of Our Lady. 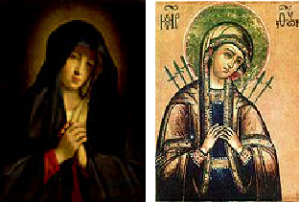 Without any thought of reciprocation, or ‘quid pro quo’, I nominate what I consider to be another great feast of Mary – ‘Our Lady of Sorrows’ – celebrated annually on this date, 15 September. It is many years ago, now, that I remember first coming across the title, ‘Our Lady of Sorrows’, though I cannot recall the source of my education, nor can I say that I ever took the trouble to research the name. However, over the years, I have come to know something about the relationship between parents and their children, and in this regard, I cannot conceive of any bond stronger than that foetal-originating connection between mother and child. More to the point, when someone, or something, hurts, or causes harm to a child, then most would agree that the parents cannot help but suffer, also – in many cases just as much as the child; of such is humanity. From this kind of standpoint, it is then easy to understand, from Jesus’ life, the many distressing sufferings Mary was to undergo as she followed her child along the ‘path of life’. After all, they were both human – with human feelings. In that special way, they were no different from any other man or woman. Certainly then, Mary fully qualifies as ‘Our Lady of Sorrows’. The title, ‘Our Lady of Sorrows’ says two things to me. Firstly, the title itself is quite beautiful, though rather sad, and secondly, in another sense, it is one that speaks of a beautiful Jewish lady, who at God’s invitation, was to become the mother of the world’s redeemer – saviour even – and in so doing endure unbearable ‘heart-piercing sorrows’ along the way. 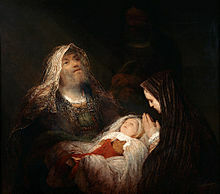 The old Jewish holy man, Simeon – a God-fearing man who, the Bible Says– ‘lived in Jerusalem’ and ‘was waiting for Israel to be saved’ (Luke 2, v25), happened to be in the Temple when Jesus was ‘presented’ by Mary and Joseph. After giving them his blessing, Simeon then said to Mary: “And sorrow, like a sharp sword will pierce your own heart.” (Luke 2, v35). The Loss of Jesus in the Temple. Mary meets Jesus in his way to Calvary. Mary receives the Body of Jesus into her arms. 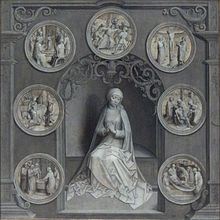 At one time, it was a popular devotion amongst Catholics, to say one ‘Our Father’ and seven ‘Hail Mary’s’, having in mind each of the seven sorrows, and using what was called the ‘Servite Rosary’. This was a Rosary consisting of a ring of seven groups of seven beads, each group separated by a small medal depicting each one of the sorrows of Mary, though in some cases this was just a single bead. A further series of three beads and a medal were also attached to the chain, before the first ‘sorrow’, and these were to be dedicated to prayer in honour of Mary’s tears, as well as to indicate the beginning of the chaplet. Conventionally, the beads were made of black wood, or some other black material, indicating sorrow. Sometime this ‘aid-to-prayer’ was also called the Seven Swords Rosary, this last title referring to the prophecy of Simeon. The Feast of Our Lady Of Sorrows, (in Western Christianity), goes back to 1413, and a Synod of Cologne, then celebrated on the Friday after the Third Sunday of Easter, but devotions to Our Lady, in this regard, go back further to 1233, and the founding of the Servite Order – also known as the Servite Friars. In 1238, this Order adopted the Sorrows of Our Lady as their principal devotion, the prayers to Our Lady being said standing under the Cross. It was they who developed the Servite Rosary. There was also the Black Scapular of the Seven Dolours of Our Lady, the black scapular being the symbol of the Confraternity of Our Lady of Sorrows, and this fraternity also owed its origins to the Servite Order. She, whose grieving was perceiving, contemplating, un-abating, all the anguish of her Son! Fire me now with zeal so glowing, love so rich to Jesus, flowing, that I favour may obtain. With the same scar lacerated, by the cross en-fired, elated, wrought by love to ecstasy! Our Lady of Sorrows – pray for us. I am very fond of this feast day, and it teaches me how Our Lady was able to remain fixed only on God, and, in Him, on others, especially her Son Jesus, also God, whom she had to ‘lose’ on the Cross when he said those immortal words to her and St. John: “Woman, behold your son, Son behold your Mother”. That was a sword all right, spoken by HER son to her. She must also have received her son in the Eucharist, after his Resurrection, and remained one with Him also, in her relationships with him present in all those around her. But she had lost him, too, in another way. There is something ‘big’ here that is also very mysterious.